It’s the ultimate crappy disguise: The spider Cyclosa ginnaga hides from predators by looking like a pile of bird feces, a new study says. Study leader I.-Min Tso, an entomologist at National Chung Hsing University in Taiwan, first made the discovery walking through a research station in central Taiwan. Tso recognized the spiders as C. ginnaga, a species found in Taiwan, China, Japan, and South Korea. Now, Tso and colleagues have discovered their defense strategy is even more sophisticated than thought. 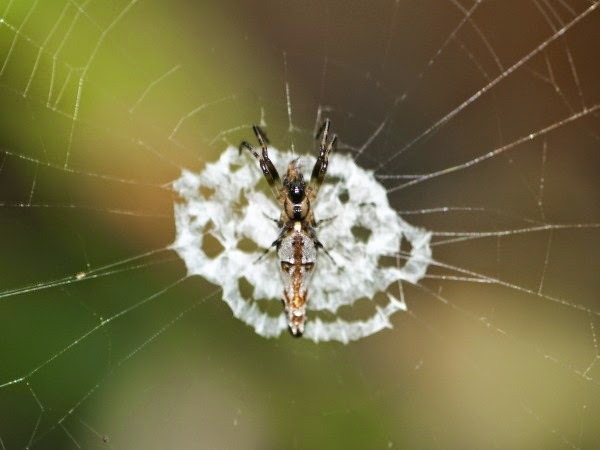 Cornell University arachnologist Linda Rayor applauded the study, pointing out that C. ginnaga is not alone in masquerading as bird droppings. “It’s really not all that uncommon. Several other spiders, like Bolas spiders, also use this disguise,” she said. To find out if the bird dropping-like web confused predators, Tso and colleagues measured the webs that resembled bird feces.